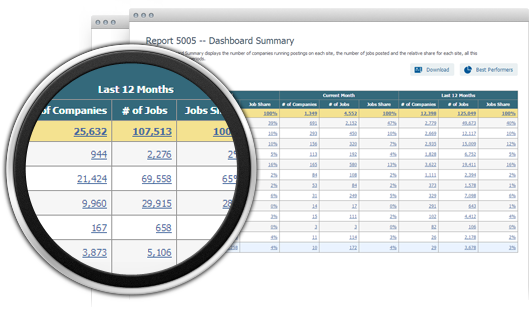 Dashboard Summary is a flexible cross-tab report that illustrates competitive activity across jobs boards in three distinct time periods. Using the report filters, you can narrow your view to say, only Direct Advertisers and widen the selected time period from a week to 'last 30-days'. A single click takes you behind any number to a list of companies posting jobs. You can view activity from one site or all sites. 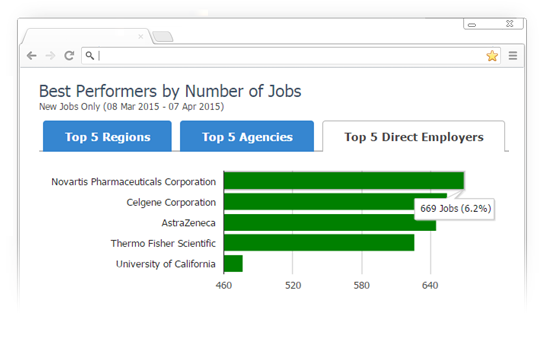 From the Dashboard Summary, click on the 'Best Performers' and you'll see the highest placement of jobs in metrics such as Region, Recruitment Agencies and Direct Employers. Hover over the bar associated with any metric and you see the job posting details. 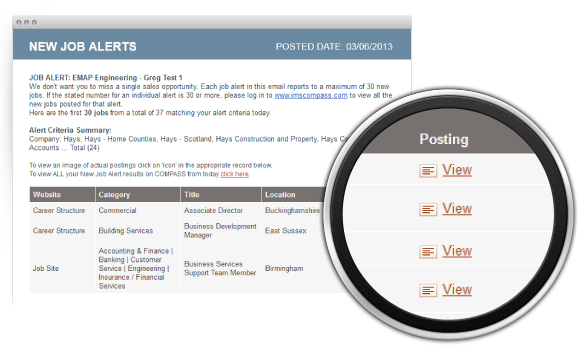 Click the bar and you will link to a list of all the company activity by the job boards they used. 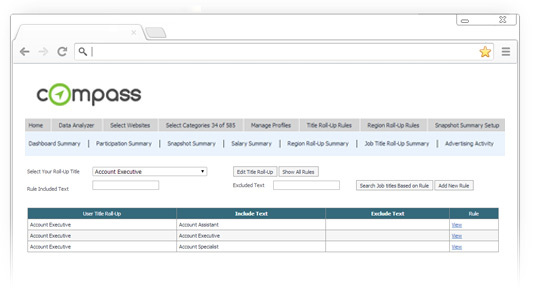 Filter your reports by Choose Company Type, All Posted Jobs or New Jobs Only (calendar post date within selected period) LIMIT YOUR DATA – Use Advanced Search to limit data to your Regions of responsibility. Choose combinations of terms that define 'best' prospects. Limit your reports to any profile and find those that match your 'high probability' prospects. Find the best of those that are not current customers and approach them using the insights you've gained from their recent activity. 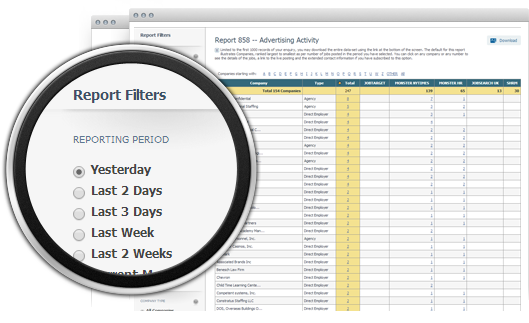 Minimal reports are augmented with comprehensive filters so you can search and find what you're looking for – Quickly. Powerful new tools are added to help you manage data on the 'fly'. 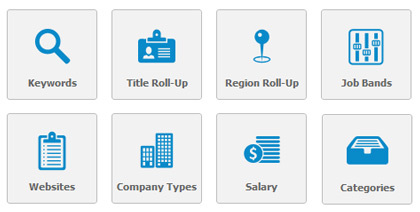 You can roll-up company names and change company type in seconds. A host of options to direct you to the opportunities you want to chase. Easy to set up, you can review all the alerts sent to you by clicking Historical Alerts.